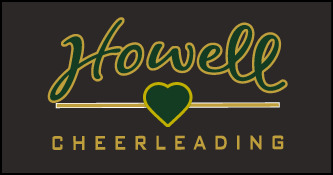 2016 HOWELL HS CHEER CAMP GEAR is now available to order online. DEADLINE FOR ORDERS IS FRIDAY, JULY 1st. ALL ORDERS WILL BE HELD UNTIL THE ORDER DEADLINE AND PROCESSED IN BULK. Delivery should be approximately July 15th. There is a $2.00 processing fee for all online orders. This fee will be shown in the shipping / handling portion of your final order. DELIVERY OPTIONS: PLEASE SELECT "IN-STORE PICK UP" FOR YOUR DELIVERY OPTION. ALL ORDERS WILL BE BAGGED WITH A COPY OF YOUR ORDER INSIDE THE BAG, AND DELIVERED TO A TEAM PRACTICE. There are other options for delivery to your home (USPS) and (UPS) at additional cost, but those may delay your order getting to you. 1. "IN-STORE PICK UP" - ORDERS WILL BE DELIVERED THROUGH YOUR TEAM AT PRACTICE. 2. USPS PRIORITY MAIL - ORDERS WILL BE DELIVERED TO YOUR HOME VIA USPS PRIORITY MAIL. THERE IS AN ADDITIONAL COST FOR THIS DELIVERY OPTION (CHEAPEST OF THE HOME DELIVERY OPTIONS). 3. UPS GROUND SERVICE - ORDERS WILL BE SHIPPED UPS GROUND SERVICE TO YOUR HOME. THERE IS AN ADDITIONAL COST FOR THIS DELIVERY OPTION(MOST EXPENSIVE OF THE HOME DELIVERY OPTIONS). There is a size chart on the description page for each item. Please refer to that chart with any sizing questions. Sizing samples are also available at Sports & Apparel in Fowlerville for viewing, or for try on.